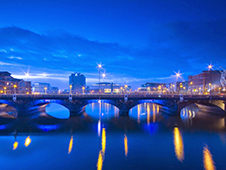 The capital of Northern Ireland, which is part of the United Kingdom of Great Britain, is Belfast. This is a very picturesque city. A small area is rich in attractions, which is quite possible to explore on foot. And in order to quickly get to the city itself, it is necessary to rent a car upon arrival at the airport of Belfast, using the services of our site. The status of the capital city of Northern Ireland acquired recently – only in the 19th century, however, the historical heritage of this does not become less interesting. What to see in Belfast? The main attraction – the Town Hall Square in the center of Donegal. Also of interest are Clock Tower, Alberta, is considered a symbol of Belfast Castle, wrapped in an aura of romance, located in the suburbs, an unusual museum "Royal Salon spirits" and the sculpture "Big Fish" and others. In the carriage of children up to 12 years, or the shorter than 135 cm is required to use child seats. If the child is under 3 years old - restraint shall conform to the weight of a small passenger. And do not forget to buckle up yourself: no matter where - front or back - you sit. If the car is not equipped with seat belts, a ban on the transportation of minors - up to 3 years old, older children in this case should be on the back seat. The penalty for violation - from 30 to 500 pounds. Dipped should be used at night while on the road without lights, and in the places where the speed of movement is limited to 48 km / h or when driving on motorways. Talking on the phone is prohibited, except when using special devices that allow for conversation, without releasing the steering wheel from his hands. Stopping at traffic lights or in a traffic jam location is not grounds for exemption from liability for violation of this rule. The minimum amount of the fine - £ 100, the maximum - in 1000. Traffic policemen watching this aspect very carefully, so you need to park very carefully and only in permitted areas. Will help to orient the line at the edges of roads. They can be double or single, yellow or red. Seeing one yellow or red line, you can put the car, but at a certain time, so look through the eyes of an additional sign pointing to it. Marking yellow permits drop off passengers, but the driver does not have to leave the room. But double counting prohibits parking at any time. To avoid penalties must be equipped to take advantage of parking for this purpose, but it should be noted that most of them will be paid. If the police are asked to undergo a breath test, they claim to perform better, since the refusal amounts to a violation and carries the same penalty as for exceeding the allowed rate equal to the UK 0,8 ‰. If the offense is committed for the first time, the purse feel better in the amount up to 5000 pounds. An alternative to this punishment - imprisonment for six months and deprivation of a driver's license for one year. This measure may also be accompanied by a fine. Speed ​​of movement within the city limits for passenger cars should not exceed 48 km / h. But after leaving the village, we can accelerate twice as fast - up to 96 km / h and on the road, or highway - up to 112 km / h. It is important to know that in the absence of various types of restrictions is considered that should drive at a speed not exceeding 48 km / h.